Every dish at Prankster is spectacular, unique and memorable and, luckily for us, there’s lots more where that came from on their new menu. Food is memory and at Prankster they take nostalgia very seriously. However, while every dish sounds familiar, it looks completely different from how you remember it and then tastes exactly like you expect it to. Confused? Don’t be – be amazed, be enamoured and be stuffed to the gills. Fortunately, the old favourites are still there – the Dahi Bhalla ice cream is fluffy, sweet and salty with sev and puffed rice for texture. The Lamb Galouti, the Fattir Pizzas and the Prankster Rose Kheer are consistently delicious. The new menu is just the chef being playful and that’s one reason this restro-bar is called Prankster. This time. he’s taken progressive nostalgia way beyond the usual with the Chhole Kulche Doughnut that’s served with Gajar Achar Mousse. It’s airy, fragrant and we’re glad they serve two. Then there is the Uttapam Waffle with Tomato Chutney Ice cream – one bite and you know it’s just the shape and presentation, that’s all uttapam there! We loved the Pickled Tawa Sausages with Maska Pao, soft sausages tossed in a spicy pickled flavoured masala served with light-as-air paos. Though the most unique thing has got to be the Lachcha Burger. With a puff pastry like burger bun and a lamb patty inside, this one is quintessentially Delhi! Whether you’ve been to Prankster once or several times, they keep giving you reasons to come back. 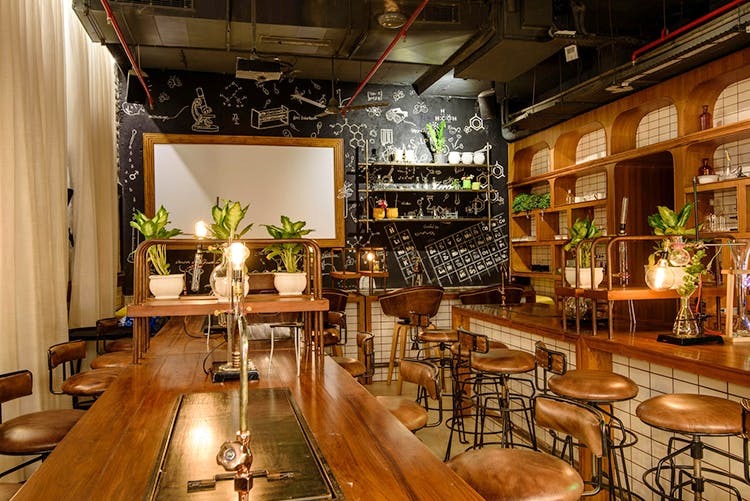 Beer & More: Plan Your Next Squad Hangout At This Microbrewery In Sector 29 & Be Amazed!